Steven Javan Jones was a popular American poet and author. The words of his poetry and writings speak right to the audience’s soul. Many people look forward to his beautiful collection to find some words of encouragement for their lives. If you haven’t yet check out his quotes or poems it is time to check out some pieces of his amazing collection, I highly recommend it. The following is a bio taken from his website. Javan poet wiki showcases his journey to becoming one of most efficacious self-published authors of America. His poems are such a beautiful compositions that you can’t go away without reading the completing piece once you start. 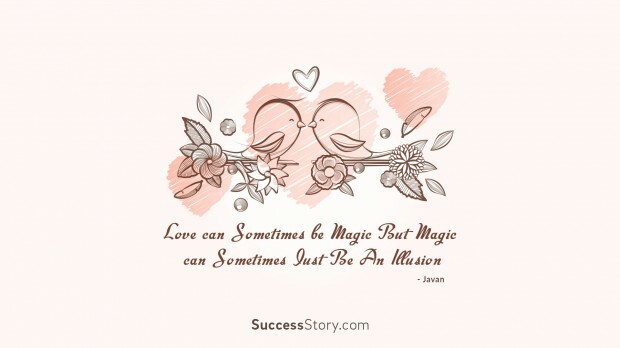 "Love Can Sometimes Be Magic But Magic Can Sometimes Just Be Illusion"
Javan was belonged to Charlotte a small town of North Carolina. Later he moved to Atlanta, where he served the Eastern Airlines as an agent. It was in 1979 when he self-published his first book. To introduce his book to the word he travelled around the country with Brandon-his golden retriever. The stories of his life are truly amazing and inspiring like his ‘penned words’. Relationships poetry by Javan form another set of motivating collection that inspire people to preserve the beauty of their relationship with their partner and others. Javan had a unique way of capturing the most important emotions of life that are hard to put into words. He relates his poems with the realities in such a way, that it becomes hard for the reader to save himself/herself from strike of the cord into the heart. His words are a simply pearls of wisdom.